Go behind the scenes of the world's most secretive business. Take a tour of a Provencal truffle plantation, learn how truffles are cultivated and truffle dogs are trained, and go on a hunt for France's elusive "black gold" with professional hunters who know all the tricks of the trade. You'll be regaled with stories of successes and sabotage while the two adorable truffle dogs uncover the elusive tuber melanosporum before your eyes. You’ll also learn to tell the difference between a real Provencal (Perigord) truffle and the “imposters” from China, plus the proper way to clean, store and cook with fresh truffles. The hunt is approximately an hour long and includes information about how truffle trees are cultivated, the special conditions necessary to grow truffles and the signs nature gives to indicate your trees might have truffles beneath them. You’ll also learn how truffle hunters use flies (and a lot of patience) to find truffles and discover why using pigs to sniff them out has become primarily a thing of the past. Guests will experience the savage beauty of a real Provencal farm. Les Pastras isn’t a big commercial producer, but a family enterprise that has been handed down from grandfather to grandson. Walk amongst the grape vines, pick some cherries or apricots from a nearby tree, visit the olive grove and even see the beehives the family uses to make their own honey. The smell of wild herbs is in the air at every turn. Tours are followed up with a sampling of fresh truffle hors d'oeuvres, Champagne and a tasting of Les Pastras’s organic olive and truffle oil. Summer guests can enjoy the view from the poolside terrace overlooking the olive trees, while the couple invites winter guests into their dining room. The four different hors d’oeuvres served give visitors a taste of how a fresh ingredient can be simply prepared and beautifully presented to maximum effect. 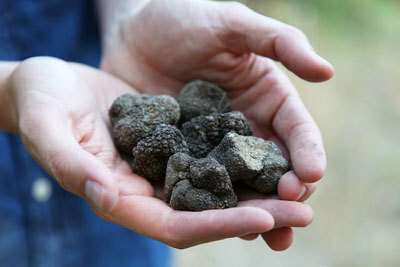 Plus, each one features a generous quantity of truffles that you won’t find in any restaurant! The young couple who own the property give 50% of the profits from all the products sold to the One Family Orphanage in Haiti, where they have helped to fund a library and computer center. Saturdays and Sundays (by reservation).